Utilising the best of both technical solutions, AGR Automations Hybrid Feeders incorporate vibratory pre-orientation and sorting complimented with vision guided robots for final orientation and transfer. AGR Automations latest innovation fills the gap where the reliability and performance of Vibratory feeding equipment has difficulty coping with complex shapes and orientation requirements. 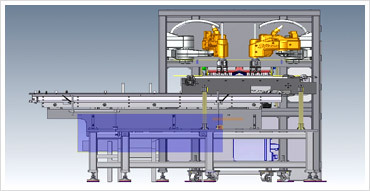 Not only does AGR Automations Hybrid Feeders offer industry leading robotic sorting and placement speeds of up to 160 picks per minute the systems can be quickly re-configured to handle a range of product variants and sizes without the need for time consuming change tooling and complex set ups. Reliable fast and consistent AGR Automations Hybrid Feeders lead the way in high speed feeding of complex components.